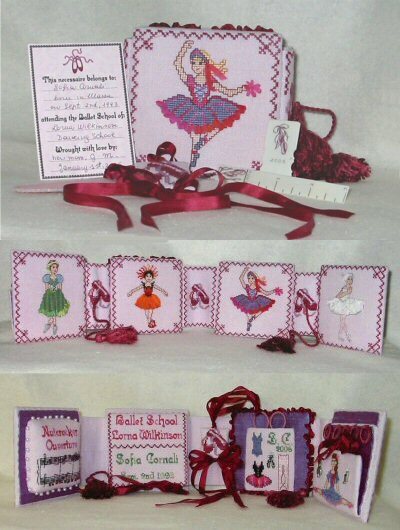 A Ballerina’s Dream has been created as a love tribute to classic ballet, teachers and dancers. Dancers need to sew their ribbons and fix their shoes in a proper way and the necessaire is just for these purposes. There are four ballerinas from famous ballets: Giselle, Petrouska, Firebird and Swan Lake. Point shoes are all over, inside center band, side bands, charms, scissors fob and the holder’s card. The pincushion design is based on the music sheet of the Nutcracker Ouverture Miniature by P.I. Tchaikovsky. So there are true musical notes but…… with glass beads! The scissors pocket displays usual clothes made just for dancing, the initials of the designer and the year of completion of the stitched design. The thread curtain represents a dancer with musical notes and treble clef charms. On the needle page cover Sofia wanted the name of her beloved school and her date of birth. We give an alphabet with numbers to personalize the necessaire. Moreover, the holder’s card gives the possibility to write information about the dancer and the stitcher. We do not know if Sofia will be a professional dancer in the future, but we know that dance and music will always have a special place in her life. For this reason the necessaire is dedicated to Mrs. Lorna Wilkinson and her daughter Barbara Bottaini, the wonderful teachers of the Lorna Wilkinson Ballet School, Massa, Italy. They have taught Sofia how to practice and enjoy dance following rules, classical positions and modern interpretation. These two special women will always be in her heart and dreams. Stitches Cross Stitch over two and over one, Back Stitch, Chain Stitch, French Knot.